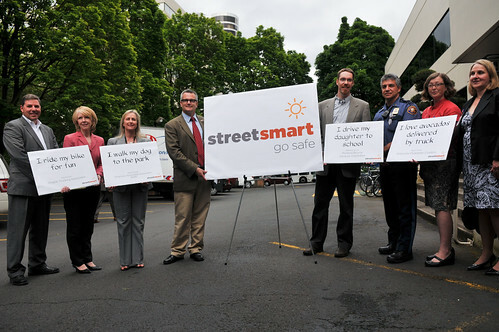 Partners on the new “Street Smart” safety campaign. From L to R: ODOT Region 1 Director Jason Tell; Debra Dunn, Oregon Trucking Association; Marie Dodds, AAA; Mayor Sam Adams; City Bike Advisory Committee Chair Matt Arnold; PPB Traffic Division Lt. Eric Schober; Willamette Pedestrian Coalition Director Steph Routh; TriMet Executive Director of Operations Shelly Lomax. 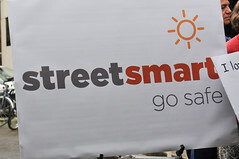 That was the opening of a speech by Portland Mayor Sam Adams yesterday at the kickoff of the Bureau of Transportation’s ‘Street Smart: Go Safe’ campaign. The campaign is a new effort by PBOT and its partners to improve traffic safety in the city. Adams focused on enforcement at the event, making it clear that he intends to get tougher on two main areas: distracted driving (cell phone use and texting) and red light running (and to a lesser extent, speeding). 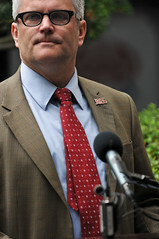 Adams said 11 Portlanders died and 3,500 were injured between 2000 and 2009 due to red light running. Also clear from how Adams and PBOT have launched this campaign is that they’re making a concerted effort to appeal to all modes of travel. 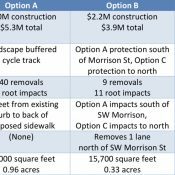 At the press conference, representatives of AAA, the Oregon Trucking Assocation (OTA), the City of Portland Bicycle Advisory Committee (BAC), and the Willamette Pedestrian Coalition (WPC) held up signs that flip-flopped their respective modes. Matt Arnold, Chair of the BAC, held a sign that read, “I drove my daughter to school” (In a speech, he also said despite the perception that people who ride bikes are “resistant” to enforcement, the BAC strongly supports enforcement actions against red light violators). PBOT noted that this is the first time ever that these various interest groups have teamed up to focus on a single set of concerns. “You can be a car driver one part of the day, but I can guarantee you, you also, in that same day, you’re also going to be a pedestrian. You can be an advocate for trucks and freight, which are a key part of our economy as a traded-sector city, but you will also want to ride your bike for fun. You can be an avid advocate for pedestrian safety and walking and running, but you also benefit from a successful and safe freight community that delivers to you what you need to live your life the way you want. Adams’ talk at the event was tough and it jibes with his consistent message of the years that safety is his top priority. However, it remains to be seen how much impact this new campaign will have (it’s also inherently difficult to judge the results given the lack of benchmark data and clearly defined goals). So far, in addition to the media coverage (which has value in raising awareness of the issues), the campaign appears to only include more targeted enforcement missions by the Portland Police Bureau. PPB Traffic Division Lieutenant Eric Schober told me he expects about one enforcement mission a month starting in late July. The PPB and PBOT will publicize the location, times and dates of those missions and they will target specific behaviors (similar to the existing PBOT crosswalk enforcement program). When asked what changes this campaign might bring to the PPB, Lt. Schober said his officers are “actively enforcing the laws now” and that nothing new internally will be done. He also pointed out that the PPB has written nearly 6,000 cell phone law violations since it was enacted in January 2010. As for funding of the campaign, there’s nothing new set-aside for it. However, from here on out, expect Adams and PBOT to fold all of their traffic safety related projects and activities into the Street Smart campaign. Adams said while enforcement is the initial focus, he promised that we’d be hearing more from him “as summer goes on” about engineering (such as new bike boxes) and educational components. Yuck? Riding a bicycle *is* fun. It is fun, but what they’re doing is contrasting the serious and necessary functions of cars and trucks with a “recreational” aspect of cycling. So? Safety is safety, and I, for one, am in just as much danger from automobiles (and, ahem, trucks, which I believe is the obvious point when a trucking industry executive is holding up a sign saying she enjoys riding her bicycle) when I’m riding around for the fun of it as I am when I’m shopping. The value of my safety is not dependent on the so-called social utility of my activity on my bicycle. Sure, but there are also larger issues at play here. This is a press conference, and if bicycling is trivialized as a mere divergence, a playful thing, nothing good will come of that in this town where it would seem plenty of people (Steve Duin?) still harken back to that kind of hierarchical thinking. If we reify trucks and cars as ‘real transportation,’ the kind that our economy depends on, that serious people engage in, then folks not partaking might as well skedaddle (for a history of this, see Fighting Traffic, mentioned here yesterday). We can do better in this town. 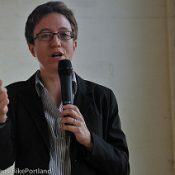 Hurrah for Bikeportland! Targeting walkers and cyclists just reinforces the hegemony of the private automobile. yes, how dare anyone hold you accountable for bad decisions that may affectively harm someone? your rights ends where someone else’s rights begin. WTF does that have to do with anything? It’s perfectly safe to cross the street against the light if there is no traffic present. and it doesn’t involve infringing anyone else’s rights. It’s perfectly safe to drive through red lights when no one else is present too. It’s also still illegal. They aren’t targeting anyone. What gave you that idea? He mentioned all users. If anything, not mentioning walkers and cyclists while mentioning cars would “reinforce the hegemony of the private automobile”. spin it any way you like, but according to Jonathan’s report Adams led off his comments on enforcement by citing walkers and cyclists first; that is exactly backwards in the risk heirarchy, since motor vehicles pose a much higher risk to other street users than walkers and cyclist ever will, and there are just as many if not substantially more scofflaw motorists out on the roads than there are walkers and cyclists. I appreciate the sentiment of the event, and found the flip-flopping messages ‘interesting’ but for the fact that the sum of them trivializes bicycles as transportation. 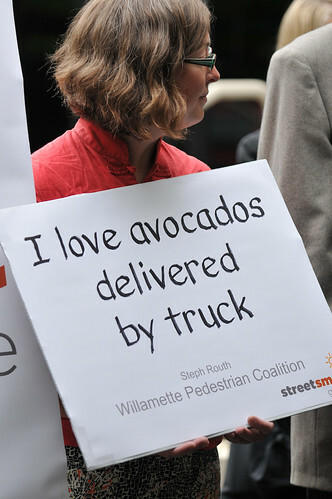 Secondly, I wish an event like this could also be forward-looking, anticipate the day when far fewer cars and trucks bringing avocadoes will clog our streets, which will almost certainly be much safer as a consequence. The silver lining to Peak Oil. That ridiculous ‘work-related’ loop hole is closing soon in Oregon. Jonathan is right. With no specific goals or data, how is this be anything more than an obviously contrived and manufactured photo op? Maybe a month from now, Adams can give some concrete stats as to how many cell phone using or texting drivers have been caught and fined since this speech. I spotted at least four today on my morning commute. 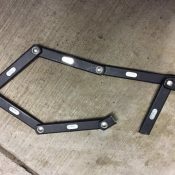 This has me wondering about the law about bikes at stop signs. Can someone link me to that? I’d love to read the exact wording. Do I have to come to a complete stop, feet on the ground and all or is slowing to what as essentially a full stop legal? Just curious. I’d rather double check now and not get ticketed later. Any help would be greatly appreciated. You absolutely DO NOT have to put your foot down. That’s an unfortunate myth perpetuated by some police officers who are not as familiar with the law as they should be. All you have to do is cease forward motion. We covered that exact question back in 2010. Read this for more info. Wheels must cease forward motion but a foot doesn’t need to be on the ground… Got it! Thanks for the prompt response, Jonathan! Perhaps a more effective approach would be a Mothers Against Distracted Driving campaign? Yeah, but to get real traction with that you need a demon as in “distracted drivers” like MADD was before they got PC. Interesting trivialization of walking and riding. interesting yes. and problematic in my opinion. not only the sign, which juxtaposes “fun” bicycling with more serious trips by other modes, but notice Mayor Adams second long quote in the article underneath the last sign photo where he talks about trucks being a “traded sector” part of our city economy and then says, again, riding a bike for “fun”. i cringed when he said that at the event. maybe some think this is me being too sensitive or nitpicky.. but it bugs me. Either don’t mention any subjective qualities or descriptions of various modes or please be careful not to trivialize bicycling, especially since it already struggles for legitimacy in the eyes of many. Yeah, and we’re going to ‘trade in’ that sector (trucking) one of these days, and ride more Truck Trikes (TM) and continue pulling bike trailers and we won’t mow down anyone because we don’t have blind spots (well maybe we have ideological ones, but those don’t kill folks like Tracey Sparling). No, that won’t ever happen. The motors might change, but there’s a large body of cargo out there that can’t be efficiently carried by light trucks (xtracycles, bakfieten, trailers, and their slightly-larger internal combustion brethren.) If I have to deliver three tons of produce to a store and don’t have access to cheap gasoline, I’d do what my great-grandfather would have done and hitch up a team of horses to deliver the cargo instead of doing 12-60 individual trips on my cargobike. If cargo wagons weren’t useful for local deliveries, they wouldn’t exist. The small-parcel LCL segment that bicycle delivery services in Portland are taking advantage of is not, by any stretch of the imagination, the only freight traffic around. horses could be useful, and we’ll probably start seeing more of them too, but there’s no need to discount loads up to 500 lbs for trailers and up to 800 lbs I’m told for cargo trikes. We have hardly begun exploring the possibilities. And most of the cargo we now send everywhere we don’t need and can get along fine without. Avocadoes? Right. If you had to pay someone to pedal avocadoes up here from Southern CA you might start looking into greenhouses. My take is that Sam Adams is so mindful of his image in the eyes of the voters–most of whom identify as “motorists”–that he makes statements like this to show he’s not a lefty whacko biker. He may understand at a fundamental level that the greater danger comes from people in cars not driving safely, but he has to show he’s being “fair” by enforcing against all modes equally. At worst it’s dishonest; at best Sam missed an opportunity to better inform the public where the danger really lies. And that’s what a safety education program should be all about. One enforcement mission a month? am i the only one who is not impressed with this? Odds are 1 in 29 that you will have the safety laws “enforced” any greater than they already are. That’s not very inspiring. I’m a little surprised by how negative many of the comments are. I think this is a great idea and well executed too. There aren’t unlimited funds for all the safety and enforcement concerns so getting the message out is paramount. In at least that respect you have to admire the way they brought together diverse interests to promote safety. negative maybe. I’d say disappointed. Opportunities are missed. If this were a serious effort, it would be less infused with silly talk of ‘biking for fun’ and ‘appreciating the trucks that bring our bikes to the store’ and more about texting. I understand that if he wants to sing Kumbaya with all those fossil fuel lobbies, he may say foolish things, but it confuses the issue so well captured in the statistics: distracted car drivers kill and maim and we should crack down on that. You know, like, how they’re doing that in Mississippi. This isn’t a serious effort? Because someone used the phrase ‘I bike for fun’? I share the concern that the wording trivializes the activity but I happen to bike for fun (usually anyway)like many riders. If we are going to make the streets safe for eight year old children and eighty year old adults maybe the message makes some sense even. For me the bottom line is thankfulness someone took the initiative to tackle the issue- with support from diverse groups that are often portrayed as at-odds with each other. it is not a ‘we’re in this all together message’ if that message is that cars and trucks are serious transportation and cycling and walking are just recreational ‘fun’. I hope they’ll focus on real problem areas and not simply jump out of the bushes in the neighborhood with “gotcha!” The Ladd’s Addition circle story from yesterday is the perfect example where the Stop sign could easily be replaced with Yield, yet might be the kind of intersection targeted by this campaign for that very same reason (people don’t really need to stop most times, so they don’t, hence a target rich environment). We’ve all seen much worse violations in terms of potential consequences around town; let’s focus on those. Else it’s like stopping people for going 1 mph over the speed limit. Politics is politcs. The mayor already has the cycling community on his side (for the most part) and if he wants another term in office the time is nigh to court other strong lobbies and influential corps. For instance, oh, let’s see, trucking and freight! To do that, you talk in their language. Give quotes that make sense to them and give the impression ‘we’re all on the same page.’ Then, if all goes well, and you’ve made enough bargains with enough SI groups, you get to keep your job. 2012 is going to be a long political year without much progress on a number of important transpo issue. 2013 can’t get here soon enough. This is a total joke. Pure PR with no substance. I predict absolutely nothing changes as a result of this BS waste of my money. Oh, for crying out loud! 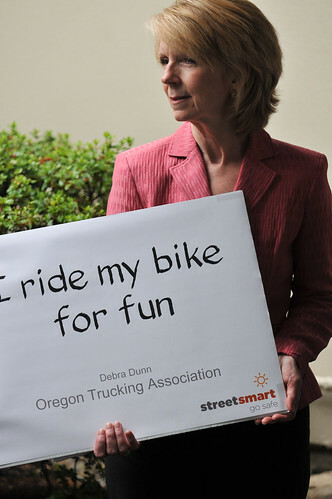 At least Debra Dunn does bike “for fun!” WTF is wrong with that? First thing I thought when I read the sign was, “hey, that’s great” And is more than can be said for a lot of people. I’m all for transportation cycling, and I’m grateful that we’ve placed as much emphasis on it as we have. But do we have to denigrate recreation cycling, apparently out of some fear that recognizing it might denigrate (“lower the value of” -BURR) transportation cycling? That’s just beyond absurd. That reminds me of all the folks on bikeportland who regard mountain bikers as if they had just farted in church or something. Overall, I’m glad they’re doing this campaign. It is sickening that we have more homicides by vehicle than by murder in Portland. Um, I think you’re missing the tenor here. Your concern about deaths from cars running over all those people will be aided in proportion to how seriously we all collectively take cycling AS AN ALTERNATIVE TO CARS. Recreational cycling is fine, healthy, familiar, non-threatening to the status quo, but that isn’t the issue here. We need to anticipate a time when fewer people have to die or be maimed by cars, and the most expedient way I can think of to do this is to take note of–and accelerate–the trend (per Sunday Parkways) that bikes are in ascendance, and (per CRC projection shortfall) that cars are on their way out. I know it doesn’t look like that to everyone…. yet. 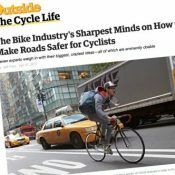 Emphasizing the fun and casual nature of bicycles/bicycling alongside the serious nature of cars and trucks does nothing to advance this reorientation of both our thinking and our infrastructure. Yeah, good luck with that. MOST people — the overwhelming and sad majority of people, in fact — are in deep, deep denial over this. It’s easy to ask people to envision a future without cars. Hate to be all doom and gloom here, but really this new conference did NOTHING to address reality and everything to soothe the masses for a few more months or weeks. Hey, I’m all for ‘bike fun’, and I participated in at least half a dozen ‘fun’ rides on Pedalpalooza; but in the context of Sam’s message, it is rather inappropriate and disingenuous, IMO. Maybe driving to work isn’t “fun”. But may I suggest most driving is for “fun”. Driving to the park, bar, theater, lake, cooking class, hobby store, while towing the boat or RV, etc, etc. Is that more “justified” than riding a bike aimlessly? Most cars are advertised as fun to drive. All those commercials shot on the swooping Bolinas Ridge road in Marin County, CA promise you that you can drive your car for “fun”. The reality however is that most of the time motorists are stuck behind each others tailpipes, emitting toxic fumes. Which are not fun to breathe. I’m all for this campaign. I hope it makes a big difference in the number of people using their cellphones while driving. Clearly jaywalking and bikes running red lights are less dangerous to the public at large. But if spending some PR cycles and writing some tickets is what has to be done to get buy in on enforcement the cellphone law I’m absolutely fine with it. Agreed! It’s not a messaging “win” for biking & walking advocates, but honestly I doubt this press conference is going to get that much play in mainstream media. It’s worth the bad messaging to get the good enforcement actions. 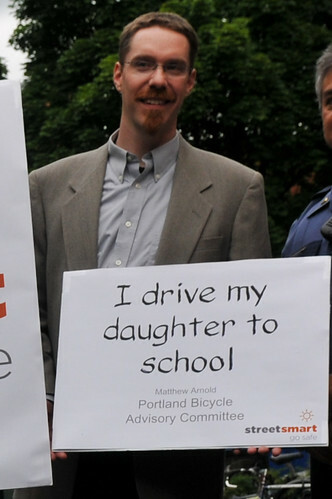 why on earth matthew arnold holding a sign saying he drives his daughter to school. …it’s obviously not a judge’s job to ‘make it stick’. That’s prosecution’s job. wtf? “Safety” in the DOT world is a term that has been totally hijacked. What “greater safety” really means is allowing motor vehicles to more easily go faster. If you are a non-mv user, never ever believe any transportation official that uses the word “safety”. Because they are not talking about the conventional meaning of the word. It’s just so much speak. glad to see that you feel the rule of the road do not apply to you since you ride a bike. remember when you are riding a bike you have to follow the rule of the road like the rest of to people on the road you are not ABOVE THE LAW! enforcement truly happened? And a breakdown,(Cell phones,red lights,peds.ect.. Unless the police are going to do a serious crackdown on drivers talking on cell phones, I don’t think this “campaign” is going to do squat. Frankly, I think it’s time we took matters into our own hands. Is there not an effective way to “call these people out” (no pun intended) when we see them in clear violation of the law? My first reaction to this news was annoyance and frustration that we still have politicians which feel like they have to appeal to the those-damn-bikes coalition. However, now that I think about it, we must see this as a transitional time for bikes. Prior commenters rightfully pointed out the demeaning “I ride my bike for fun” sign. Bikes should be seen as a legitimate transit alternative, they should be accorded with the same respect and expectations as other traffic. In the long-run, we will give them priority over cars as they do in good European cities. But on the way to this utopia we must endure the ridiculous spectacle of cops sitting in cars ticketing bikes for failure obey trafic control devices. We just have to wait 20 or 30 years for all the old conservatives to die off. Uh, perhaps Ms. Dunn actually DOES ride her bike for fun? While it would be nice to have the representative from the Oregon Trucking Association holding up a sign that says “I ride my bike 25 miles to work each way year round” and the AAA rep holding a sign that says “To get to my job, I have to walk for miles on 82nd, dodging drunk drivers and getting screamed at by teens in Jeeps,” I’m fine with small, truthful steps that reflect, you know, _reality_. Frankly, anything that contributes to increased enforcement of red light running and distracted driving is welcome news to me, even if the messaging isn’t pitch-perfect. [snip] We just have to wait 20 or 30 years for all the old conservatives to die off. What’s remarkable is not the obvious pandering of the signage but rather the rapidity of change in Portland over the last 20 years. If you take a longer perspective, it’s really amazing. yeah, give people warning so they can obey the law on that day in that area… FAIL! I love that the AAA office is surrounded on four sides by rail transit: Streetcars on Market and Mill and MAX on 6th and Broadway. Maybe she’ll ride transit to work. HEY! I can actually answer that one! Answer: because it’s (basically) true. We live in Sellwood, and, for lots reasons I won’t go into here, our daughter attends school in Southwest. Bikes are a major family value, but with a trailer, the Sellwood Bridge is a major barrier in and of itself. And the hills and lack of safe or comfortable facilities in much of Southwest present greater challenges than we feel it’s reasonable to battle on a daily basis (especially in the rain and dark of winter). The only twist is that it’s mostly my wife who drives the kid to school, although I do it periodically. Said differently: the sign was my idea and mine alone. i do understand, matt, that the premise here was to have each person holding a statement that was at least slightly at odds with what someone’s preconception might be — the freight person saying she does actually sometimes ride a bike, the pedestrian advocate saying she buys food that was hauled here by trucks, etc. but the unfortunate (inevitable) effect was to have the bike/ped people essentially apologizing for their nonconformity to the motoring norm. i suppose you can’t readily find a freight person who bikes her daughter to school, but that merely underscores the fact that this “hey, i am not the caricature you imagined” campaign is misconceived. the larger public needs to see that a guy who has a respectable white collar day job does bike his kids to school, and that a degreed professional does walk and/or take transit to work, etc. Others could come up with far wittier ones, I’m sure. excellent examples. i have in fact taken taxis to outpatient procedures, and when we had out of town guests last year we met them at the airport on the MAX and put them in a hotel that was within walking distance of the MAX. confession: we did rent a zipcar for a daytrip to the gorge and hood river. but the point being, and you nailed it, that the p.r. people who came up with these slogans completely missed the implications of their messaging. it is forgivable, people do make mistakes, but mistakes tend to have consequences. so let’s try to be more vigilant, kids.